My family and I attended a free screening of Disney’s The Nutcracker and the Four Realms. All opinions expressed are my own. Last night my family got to see an advance screening of Disney’s newest movie The Nutcracker and the Four Realms. To say I was excited was an understatement and I waited anxiously to get off work ALL DAY. I had told RJ in advance that we were going to see the movie because I wanted to get him excited for it even though he was excited about getting to go to the movies in general. I showed him the trailer and waited for his reaction. And then I asked excitedly “Do you wanna see that? And he was like… “Ummmm I wanna see The Grinch”. HA! Shut my little dreams down. But let’s remember he’s (newly) 4 and so cartoons are life. That’s all he knows. ANYWHO despite him wanting to see the Grinch and not giving a hoot about the trailer I showed him we ALL took ourselves to the screening last night. Please excuse me for looking atrocious, I just came from work! All Clara (Mackenzie Foy) wants is a key – a one-of-a-kind key that will unlock a box that holds a priceless gift. A golden thread, presented to her at godfather Drosselmeyer’s (Morgan Freeman) annual holiday party, leads her to the coveted key—which promptly disappears into a strange and mysterious parallel world. It’s there that Clara encounters a soldier named Phillip (Jayden Fowora-Knight), a gang of mice and the regents who preside over three Realms: Land of Snowflakes, Land of Flowers and Land of Sweets. Clara and Phillip must brave the ominous Fourth Realm, home to the tyrant Mother Ginger (Helen Mirren), to retrieve Clara’s key and hopefully return harmony to the unstable world. The Nutcracker and the Four Realms is rated PG and has a run time of 1 hour and 40 minutes. 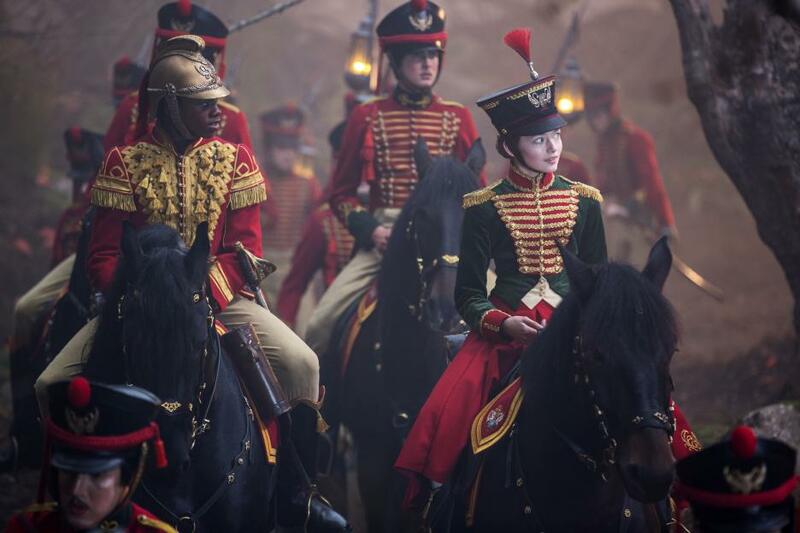 Is the Nutcracker and the Four Realms appropriate for younger children? The movie is rated PG and I think that starts at age…. 7? I think the movie is true to rating. The scene where Clara and Phillip go to the Fourth Realm is a little dark and RJ told me he didnt like it and it was scary. If you have younger kids I would just be mindful of that scene. Other than that I think it’s appropriate. So… will my son enjoy the movie? So even though RJ completely played me when I showed him the trailer, he loved the movie (other than the scene I mentioned). When he got home from school today he asked me could he watch it on TV LOL. The movie is honestly amazing and great for all audiences. I think the best age would be elementary aged, any older or younger and they (the boys) may not be too interested. But all in all, your whole family will love this movie! The Nutcracker and the Four Realms releases in theaters everywhere 11.02.18! Life with Tanay is your guide to NYC, parenting, positivity and entertainment. I provide all this to you all while encouraging you to show up everyday as the biggest version of yourself! THE Ultimate List of Black Mommy Bloggers! Our Latest Reaction Video – Aladdin!